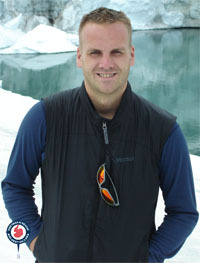 Ian Kirk (born in 1980) was one of the team members of the RAF 'Southern Reach' expedition which has attempted the trek Hercules Inlet - South Pole during autral summer season 2006-07. They had to be rescued by ALE logistic being at only 190 km from the Pole. Corporal Ian Kirk (27) is currently serving as a RAF Policeman at RAF Kinloss, Moray and has been since June 2001. He has served with the RAF for 4 years, mainly in Scotland but has also seen tours of duty in Iraq, Kuwait, Afghanistan and Oman. He is a part time member of the RAF Kinloss Mountain Rescue Team for a little over 3 years, spending the majority of his spare time dedicated to the rigorous training and numerous call-outs. Ian came up with the idea for the Expedition in July 2004 and has been hard at work planning and coordinating the venture in his limited spare time. Ian is a keen windsurfer, golfer and mountain biker.